On my desk, I have this little canister full of little trinkets that I've collected over the years. In it you'll find some old bottle caps, a few nifty looking rocks, a bunch of little toys and some pins that I was given for whatever reason....every time I find a new little treasure, I put it in this canister with all my other treasures. I'm not sure of the time line, but I think the day after I donated my liver, my transplant coordinator Cailin, dropped by my room for a visit. After the visit, she handed me an envelope which contained a schedule of follow-up appointments for after care. Fastened to the corner of that envelope was this pin below. 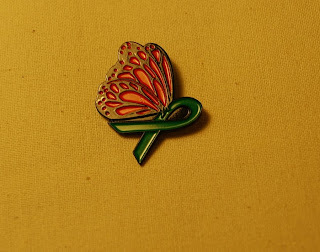 It's my donor pin, and probably my most cherished treasure ever. That is gorgeous! I, too, love little trinkets like you describe. I have cute little everythings that bring back memories including many pins. This is great and I'm sure you cherish is greatly.